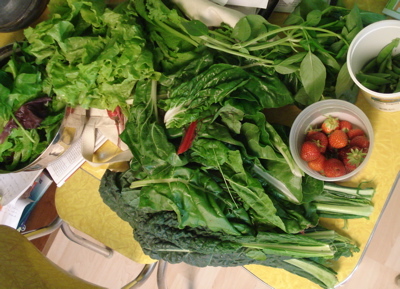 This entry was posted in CSA veggies, knitting and tagged AVFKW, black bfl, CSA, farm share, fireside chat, FO, handspun, hello yarn, knitting, legwarmers, patchwork, spinning, sushi, veggies by barefootrooster. Bookmark the permalink. Those are SO beautiful!! 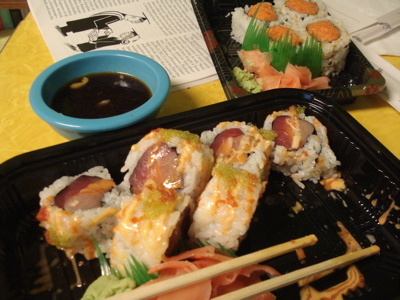 And the sushi looks delicious. Is 8:30 too early for lunch? I want sushi now! I love those legwarmers. 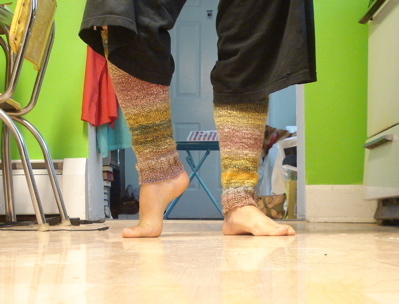 Might have to copy you – that colorway would make for very happy legwarmers for the coming winter! Cute! They look very cozy. Those legwarmers are awesome. Period. I love how the stripes almost match up, but not exactly, and the colors are gorgeous. Yay for handspun legwarmers! Love the legwarmers! They’re so cute, and I love that they’re not slouchy like the eighties versions I remember. Mmm, seasonal strawberries are soooo good. Lovely! And can I add I’m very jealous that your mornings require legwarmers? All of that food = YUM! I ate cherries for lunch yesterday; it was very satisfying. 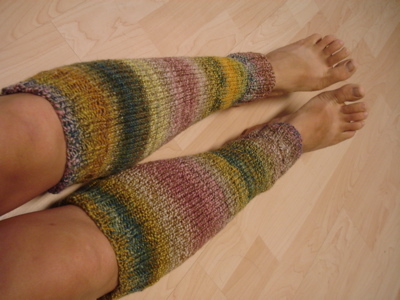 The legwarmers look so comfy and the colors are really beautiful! I may have to add a pair of them to my knitting to do list. Thanks for sharing the pattern and all I can say about sushi and fresh summer berries is YUMMY! Those legwarmers turned out great! 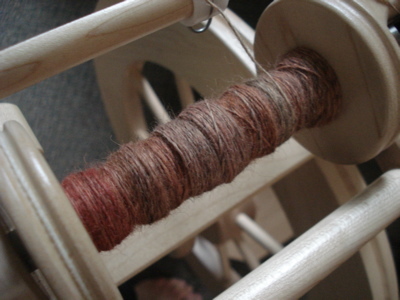 Excited to see your next spinning project, and hooray for awesome sushi! I’m totally addicted to it–glad you have a good place in town to frequent! The legwarmers are fabulous! I have some navajo churro coming my way and I think that’s what it will become. Yum!